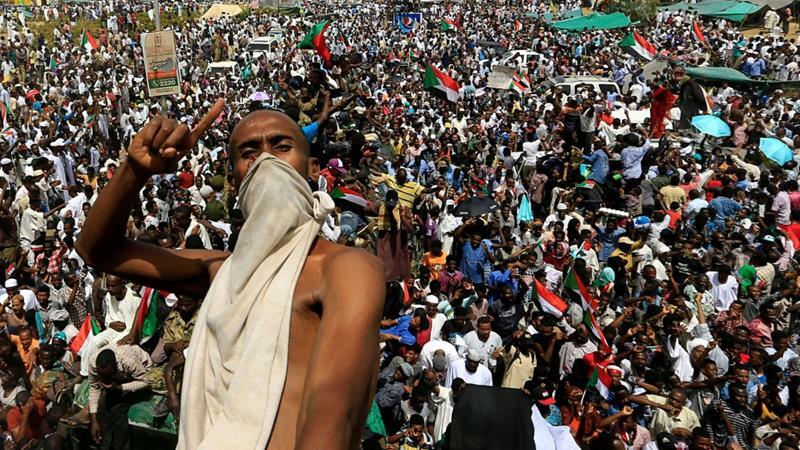 Sudan police: 16 killed by stray bullets at protests and sit-ins Police say 20 people also injured as demonstrators vow to stay on the streets until civilian government takes office. The transitional military council said on Saturday the head of the National Intelligence and Security Service (NISS), Salih Ghosh, has resigned from his post. “The chief of the transitional military council, Abdel Fattah Burhan, has accepted the resignation of… the chief of NISS,” the council said. Ghosh had overseen a sweeping crackdown led by NISS agents against protesters taking part in four months of mass demonstations. The spy chief’s resignation comes less than 24 hours after the Sudanese military replaced the country’s transitional leader who had been in power only one day. Thousands of jubilant protesters celebrated in the streets of Khartoum on Friday, after Defence Minister General Awad ibn Auf, announced he was stepping down as head of the ruling military council. He had been named the de facto leader after President Omar al-Bashir was forced out of office on Thursday after 30 years of rule. Ibn Auf said he would be replaced by General Abdel Fattah Burhan, general inspector of the armed forces, as head of the transitional council, which will rule the country for two years until elections. “This is for the benefit of our nation … This country has great people and a great army,” Ibn Auf said in a brief TV statement, adding that he hoped the civilians and the military would work together. Burhan, who was appointed as al-Bashir’s chief of staff and head of the ground forces in February, is expected to speak to the nation on Saturday. While it’s not clear whether Burhan will hand power to a civilian leader she said protesters might be more receptive to Burhan than his predecessors. “Most people are hopeful because Abdel Fattah [Burhan] is not from the ruling party. He also does not have any political affiliation. He doesn’t have the same tainted history as Omar al-Bashir and Awad Ibn Auf. Both were accused of war crimes in the region of Darfur,” she said. Hajooj Kuka, an activist, said removing al-Bashir and his allies was the first step to meeting the demands of the protesters. “We expect after everything settles down to have whoever that committed a crime to be punished. And that should include anyone who has been part of this regime that has committed a crime. It could take a while but we need to have justice,” Kuka told Al Jazeera. Earlier on Friday, the military council had assured the country that they had “no ambitions” to permanently rule the East African nation. The council also said a two-year timeline for the military to rule was not set in stone and promised that it would be dissolved as soon as a solution to the political crisis had been found. But the protest’s main organisers reacted by vowing demonstrators would stay on the streets until they got a civilian government. The Sudanese Professionals Association (SPA) said in a statement on Facebook that Ibn Auf’s resignation was a victory for the will of the people. The group called for the immediate transfer of power as well as the arrests and trials of all leading figures of the past regime involved in crimes against the people. “In order to implement these demands fully, we must adhere to our sit-in in front of the army HQ and in the capital and launch action in all Sudanese cities until power is transferred in full to a transitional civilian government expressing your aspirations,” the SPA’s statement added. Oil-rich Sudan’s economy was hard hit when it split from South Sudan in 2011, and the government is currently facing an economic crisis while also battling several rebel groups. Protests first started in December over an increase in the price of bread. They quickly evolved into demands for 75-year-old al-Bashir’s departure.